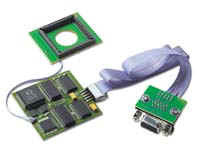 An internal scandoubler designed for installation in an A4000 or A1200. There are two versions of this device, both have a main board which clips onto the LISA chip and one version has second board which clips onto the Alice Chip and the other version externally plugs into the 23-pin VIDEO port. The Scan Magic is very similar to the Flicker Magic, except it does not peform flicker fixing. The main difference to the Flicker Magic is the missing RAM chips on the board that clips over the LISA.